Karabakh MP Hayk Khanumyan was hospitalized in Stepanakert on Monday with a broken nose, cheekbone and ribs hours after announcing the launch of a campaign for former Karabakh military commander Samvel Babayan to be appointed defense minister. Babayan returned from de-facto exile in Russia in May and traveled to Stepanakert over the weekend. Khanumyan accompanied him during his Sunday public appearance in one of the town’s squares to where hundreds of residents had come to greet him. The former strongman downplayed his political ambitions, however. Parliamentarians in Karabakh condemned the beating of Khanumyan, but stopped short of alleging political motives behind it. 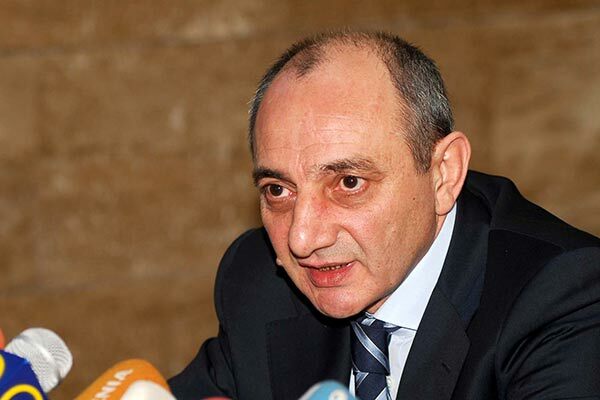 In his statement President Sahakyan said: “I consider unacceptable the incident that occurred to National Assembly member Hayk Khanumyan… I strongly condemn any act of violence against a person and a citizen. Violence against the NKR National Assembly deputy, political figure gives additional cause of concern. “All details concerning the investigation process will be presented to the public in accordance with the procedures and time frames set by the law. I also keep in touch with the minister of health, I am regularly informed on the health condition of Mr. Khanumyan and wish him a speedy recovery,” Sahakyan concluded.